Last night's (Friday, March 11, 2011) episode of CSI:NY (Season 7, Episode 17, "Do or Die") on CBS featured a (I assume, fictional; I can't think that any private school would want itself connected with eve a fictional "murder") private academy which had it's own "crest". The opening scene had one of the school's administrators showing a group of parents of prospective students around the school, "Archford Academy", "established in 1918", and was showing them a large depiction of "our school crest". Alas, it was only seen nearly from the side; apparently the director thought that more people would be interested in the people in the picture, completely leaving out the "heraldry enthusiast" demographic! and on a couple of brass plaques placed on either side of the main entrance. As you can see from these (not terribly great, I know) screenshots, it's a pretty run-of-the-mill design for an educational institution, with the lamp of knowledge and a book placed prominently on it. 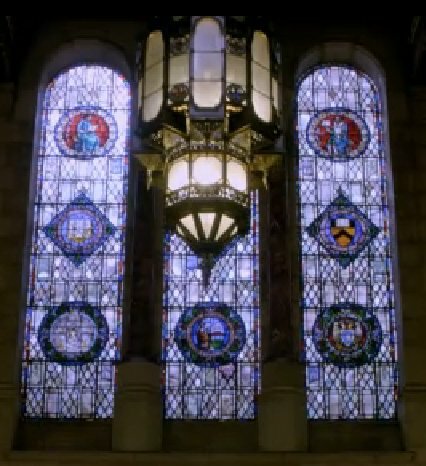 There was also, in the first scene, a nice shot of a large stained glass window containing, among other things (including another difficult to make out coat of arms at the bottom right and what appears to be the seal of the State of New York at the bottom center), what I am assuming are either the arms of the real school being used for the location shots or the arms of its founder, perhaps differenced with the addition of an open book on the chief (at the right center). But that's all just speculation. In any case, it was great to run across the use of heraldry, even if misnamed as a "crest", in a television show. Those arms at the right centre appear to be the arms of Princeton University (see at the top of this page:http://en.wikipedia.org/wiki/Princeton_University). Good catch! (I thought I'd seen that coat of arms somewhere before, but I just couldn't place it.) It does ineed appear to be the arms of Princeton University (also seen at http://www.princeton.edu/main/). The university is located in Princeton, on the western side of New Jersey.